New! The Billion 8800NL has been upgraded to the 8800NL V2, and now incorporates two external antennas to improve wireless range. 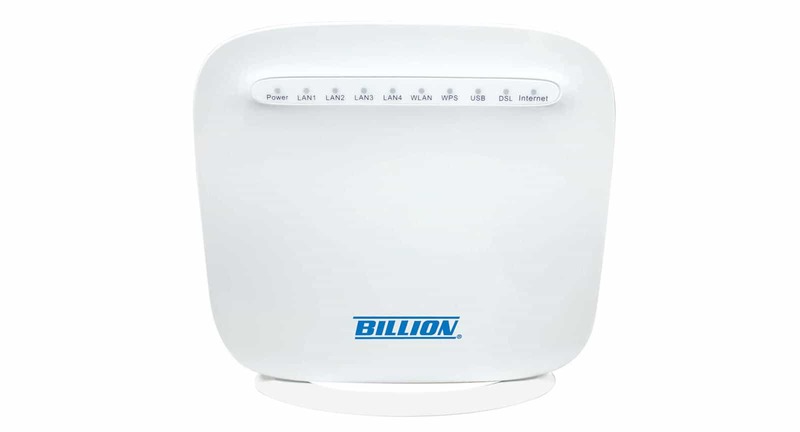 We are really excited to bring you our review and optimisation guide for the new Billion BiPAC 8800NL wireless modem router. This new wireless modem router supports ADSL, ADSL2+ AND VDSL2 (i.e. fibre broadband) connections, and at a surprisingly low price. Not only this, it offers target Signal to Noise Ratio (SNR) margin adjustment with ADSL and ADSL2+ connections to allow broadband users to extract the maximum speeds from their lines. It supports 2.4 GHz WiFi. New! The Billion 8800NL is fully compatible with vectoring. See our article Fibre Broadband Vectoring Finally Arrives. New! The Billion 8800NL is fully compatible with G.INP - an enhancement that increases fibre broadband speed. New! The Billion 8800NL is also fully compatible with BT's TV service, unlike many other third-party routers. To set up the 8800NL for BT's TV service visit our Billion 8800NL BT TV set-up guide. fibre broadband users who are seeking a cost-effective modem upgrade for their existing fibre broadband service. We think that the 8800NL is going to fly off the shelves and introduce whole new segments of broadband users to the Billion brand. Highly recommended! Until now, Billion has provided two distinct product paths, depending on whether broadband users have access to Fibre to the Cabinet (FTTC) services or conventional ADSL and ADSL2+ broadband. For fibre broadband users, Billion has provided a relatively restricted choice of firewall routers (BiPAC 8200 or 8200N) or a dedicated VDSL2 modem (BiPAC 8200). Broadband users restricted to ADSL and ADSL2+ services have had the choice of a number of router modems, including the outstanding Billion 7800DXL. All these have not incorporated a VDSL2 modem to support fibre broadband services. A killer feature of the 7800DXL is its ability to easily tweak the target signal-to-noise (SNR) margin to maximise broadband speed by taking back control of lines from overzealous Digital Line Management (DLM) systems in exchanges. As shown on our Broadband SNR Margin Tweak page, adjustment of the target SNR margin can substantially increase downlink speeds. The new Billion 8800NL is a breakthrough product, by not only combining an ADSL/ADSL2+ modem for conventional broadband services with a VDSL2 modem for FTTC fibre broadband services, but also by incorporating target SNR margin adjustment for ADSL and ADSL2+ services! When we heard about the development of the Billion 8800NL several months ago, we were told that pricing would be very affordable. We were skeptical that we would see the launch of a product with target SNR margin adjustment for ADSL/ADSL2+ AND VDSL2 capability at a price significantly lower than the Billion 7800DXL. We were wrong! Billion has managed to smartly accomplish this feat by reducing the features in other areas compared with the Billion 7800DXL (e.g. removal of external antennas, not supporting 5GHz WiFi and providing only one Gigabit Ethernet port). For many broadband users, we believe these compromises will be very acceptable. Our first impression, particularly after recently opening the Billion 7800DXL box, was “Oh, what a small box”. The Billion 8800NL has a much smaller footprint that the Billion 7800DXL, for example. Compared with the more industrial look of the 7800DXL, the 8800NL looks rather elegant, helped by the absence of external antennas. The 7800 modem routers definitely share a traditional slab-like appearance, whereas the 8800NL is sleeker and stands vertically. Despite the fact that the Billion 8800NL is very affordable, there is no obvious evidence of cost saving. We think that many broadband users will like the sleek look and small footprint of the Billion 8800NL, which is more akin to what you would expect from the likes of Apple. In operation, the 8800NL feels less hot in operation than the 7800N and 7800DXL. Once plugged in, set up was easy. Having only recently reviewed the Billion 7800DXL, we found that all configuration menus for the 8800NL were very similar to the 7800DXL, and were very straightforward to navigate. adding an affordable gigabit switch, such as the Netgear gigabit switch sold by Amazon UK. purchasing the more expensive Billion 8800AXL instead (which supports Gigabit Ethernet on all ports and 5GHz WiFi). In all cases, the additional device should be connected to the one gigabit Ethernet port on the 8800NL. First, we started with looking at the performance of the BiPAC 8800NL with conventional broadband. The Billion brand has gained a loyal following among enthusiasts, with Billion having developed a well-deserved reputation of developing modems that allow broadband users to squeeze out the very best speeds from ADSL and ADSL2+ lines. Just as with the Billion 7800DXL, the Billion 8800NL features the very latest Broadcom chipset for reliable performance with the most challenging ADSL, ADSL2 or ADSL2+ connections. In our testing, we could not detect any difference, in terms of connection rates or line stability between the more expensive Billion 7800DXL and the Billion 8800NL. In other words, performance is excellent. At this price point, Billion could have easily decided to not include the valuable target SNR margin adjustment capability seen on the 7800N and 7800DXL modems. Thankfully, it decided to include this great feature on the 8800NL, potentially bringing the benefits of target SNR margin adjustment to significantly more broadband users. Target SNR margin adjustment with the 8800NL can significantly improve download speeds for many broadband users, as described in our Broadband SNR Margin Tweak page. No longer are broadband users completely dependent upon exchange Digital Line Management (DLM) systems, which can sometimes increase the target SNR margin to very high levels (substantially reducing download speed). While many broadband lines can function perfectly adequately with a 3 dB target SNR margin without issue, DLM systems often set the target SNR margin above this figure. For example, the default target SNR margins used by BT and TalkTalk equipment are 6 dB and 9 dB, respectively. Furthermore, DLM equipment at the exchange can potentially increase the target SNR margin to 18 dB. Changing the target SNR margin from 18 dB to 3 dB can more than double download speeds! As with the new Billion 7800DXL, the target SNR margin adjustment feature is very simple to configure, and is accessed from the ‘Configuration’ ‘WAN’ ‘SNR’ submenu (as shown below). The table, below, provides the numbers that need to be entered to obtain different reductions in the target SNR margin. We slowly decreased the target SNR margin until we were happy that we had achieved the highest download speed without making the line unstable. Once you get used to being able to adjust the target SNR margin, it is very difficult to return to a modem without this facility as you really do feel out of control! On the previous subject of feeling out of control, nothing irritates us more than not being provided with the necessary information to judge the performance of a broadband connection. When fibre broadband was introduced, BT Openreach decided to roll out VDSL2 modems that do not provide line statistics that are accessible to broadband users. While some enthusiasts have been able to 'unlock' some models to provide statistics, this is by no means easy to do and does not work with all models. The Billion 8800NL incorporates a VDSL2 fibre broadband modem and provides an extensive set of line statistics, to make it easier for broadband users to identify possible line issues or faults. We were not able to distinguish a difference in fibre broadband speeds between the Billion 8800NL and an ECI Openreach VDSL2 router. This is not unexpected since the target SNR for VDSL2 cannot be adjusted as it can with ADSL and ADSL2+ connections to increase download speeds. Despite this, we feel that the presence of detailed line performance information and statistics makes the Billion 8800NL a sensible upgrade for fibre broadband users wanting to know exactly what is happening with their connection. We think that the BiPAC 8800NL will prove very popular with broadband users currently dependent on ADSL and ADSL2+ services but intend to move to fibre broadband services as soon as they become available. The SNR adjustment feature may be extremely valuable to maximise conventional broadband speeds without users feeling that the investment will be wasted once fibre broadband arrives. Particularly given the affordable price of the 8800NL, many broadband users may now be happy to invest in a solution to extract the best speeds possible from conventional broadband even if the arrival of fibre broadband is imminent. So what about the design 'compromises'? Compared with Billion's premium modem routers, it is obvious that the company has limited some features to be able to deliver the 8800NL at such a tempting price. So, let's consider the extent to which the missing features affect our view of the product. For conventional broadband users, perhaps the biggest difference between the Billion 8800NL and the 7800DXL, say, is in WiFi capability. The BiPAC 7800DXL supports the 5 GHz frequency band (as well as the 2.4 GHz band) and has external antennas, whereas the 8800NL only supports the 2.4 GHz band and has internal antennas. As fans of the 5 GHz bands, which tends to have significantly less interference than the crowded 2.4 GHz band, there's no doubt that we prefer the freedom of having the choice of frequency band (and the resultant increased WLAN throughputs). Furthermore, our testing clearly showed that the wireless range of the Billion 7800DXL was superior to the 8800NL (at 2.4GHz). However, for many users, the WiFi performance of the 8800NL will probably be good enough. Also, in our office, we actually use Apple AirPort Extreme wireless routers so would not need WiFi capability at all on a modem. Many users may be in a similar position. Our recommendation is that if you require the very best performance and range with WLAN, and rely on conventional ADSL or ADSL2+ broadband, then opt for the Billion 7800DXL. Alternatively, use or purchase a dedicated wireless access point or wireless router. You could also opt for the more expensive Billion 8800AXL with dual-band WiFi. Another difference between the Billion 8800NL and the 7800DXL is the number of gigabit Ethernet ports. The 7800DXL incorporates four gigabit Ethernet ports. In contrast, the 8800NL only has one gigabit Ethernet port. Whether or not you are bothered by this difference is down to whether you are operating a gigabit Ethernet network. In our office, we plugged the Billion 8800NL into a Cisco gigabit router so we would not be interested in the routing capability of the device. So, if you want to support a Gigabit network, you would need to opt for the Billion 7800DXL, use/buy a separate gigabit router (just using the 8800NL as a modem) or buy an affordable gigabit Ethernet switch (which is the cheapest option). The more expensive Billion 8800AXL supports gigabit Ethernet on all ports. All in all, we have been very excited by the Billion BiPAC 8800NL. We suspect that many conventional broadband users will be enticed by a compelling mix of affordable pricing, target SNR margin adjustment capability and VDSL2 future proofing. Additionally, we think that the 8800NL will find a home in many fibre broadband households as a cost-effective upgrade for users requiring line statistics. If you are looking for 5 GHz WiFi support and gigabit Ethernet on all ports, you may prefer to purchase the new Billion 8800AXL. New! The 8800NL has been updated to the 8800NL V2, which incorporates external antennas to improve wireless range over the original 8800NL. If you would like to purchase the Billion 8800NL V2 at an excellent price, please consider doing so through the Amazon UK link below, which will help contribute towards the costs of running this broadband information site. Thank you. Don't forget to read our Increase Broadband Speed Guide for tips on how to squeeze out the very highest speed from your broadband connection. Did you realise that WiFi could be the bottleneck of your Internet connection? View our WiFi Optimisation Guide for help on how to optimally configure your WiFi.